Gasoline and diesel fuel analysis, both with and without Eco-Fuel Saver, has been conducted independently by both OTI Canada Group www.oticanadagroup.com and ESDC www.esdc.com. Diesel fuel samples were pulled from CAD Railways existing stock of #2 diesel locomotive fuel. Eco-Fuel Saver (EFS) was mixed and tested at the recommended treatment rate provided by EFS/International Eco-Fuels Corp. (30 mL per 60 litres or 1 oz. per 15 U.S gallons), as well as tested at 3 TIMES the recommended treatment rate and 7 1/2 TIMES the recommended treatment rate. Technicians and engineers from CAD Railways Industries drew the samples and did all of the mixing from several sample bottles provided by EFS/International Eco-Fuels Inc. for the testing of EFS in diesel locomotives. EFS/International Eco-Fuels Corp. executives or employees were never present during the drawing of the fuel samples, the subsequent mixing of the product or the shipping of the samples to the testing laboratories. Likewise during the preparation of the gasoline testing samples, a technician from CAD Railways Industries purchased regular pump grade 87 octane fuel from a local ESSO station in Montreal, Quebec, Canada. All gasoline testing samples were handled, mixed and shipped without any involvement from any EFS/International Eco-Fuels Corp. executive or employee. In this way, the true independent and pure nature of the testing protocols were preserved and protected. Both the diesel fuel and gasoline tests were conducted under the strict guidelines of ASE, ASTM, CARB, EPA, and Canadian EPA protocols. Eco-Fuel Saver has been conclusively proven, under the highest level of testing protocols in the world, and in a totally independent process under which these tests were administered, that Eco-Fuel Saver IS SAFE TO USE IN ALL GASOLINE AND DIESEL FUEL APPLICATIONS and that on a chemical level, Eco-Fuel Saver actually enhances gasoline and diesel fuel. In July and August, 2011, CAD Railways Industries had comprehensive fuel analysis tests performed on standard #2 diesel fuel with and without ECO-FUEL SAVER Fuel Reformulator. Twenty four (24) individual certified tests (see PDF files in this section) were performed to analyze 18 different properties of diesel fuel with and without ECO-FUEL SAVER. These fuel tests were performed by two separate testing companies - ESDC (A Division of CAD Railways) and The OTI Canada Group. CAD Railways is an independent locomotive and railway testing facility located in Montreal, Quebec, Canada. This facility is used by all North American railroad companies to test new technologies in fuel efficiency, emissions reductions, aerodynamics, engine lubricants and fluids, as well as to retrofit and recertify locomotives and rail cars. The fuel tests performed for and by CAD Railways on ECO-FUEL SAVER are ASE, ASTM, CARB, EPA, and Canadian EPA certified. The conclusion to these comprehensive tests was that ECO-FUEL SAVER did not substantially alter the liquid, chemical properties of diesel fuel and was found safe to be used in all diesel engines. Siamak Moshiri, Project Leader and Emission Test Engineer for CAD Railways said; "The railroad is concerned more with the quality of the fuel than even the efficiency of the fuel as fuel quality directly impacts engine longevity for locomotives". ECO-FUEL SAVER DOES NOT negatively alter the fuel in its liquid state. In fact, as the test results show, it improves the fuel quality, especially in reduced particle size and conductivity (static). ECOFUEL SAVER enhanced fuel also offers more lubricity over standard #2 diesel fuel. Therefore, there are NO WARRANTY ISSUES when ECO-FUEL SAVER is used in diesel fuel. Nor are there issues or worries with fuel tanks, fuel lines, injectors, injector pumps, or the engine itself. ECO-FUEL SAVER simply helps facilitate more complete combustion of the fuel in the combustion chamber itself. Under the tremendous temperatures and pressures in the combustion chamber, ECOFUEL SAVER's reduced co-efficient of friction allows for a better and more complete atomization of the fuel. Simply put, ECO-FUEL SAVER helps the fuel - with the aid of the engine - do what it was designed to do; allows the fuel to combust more completely, through a series of rapid chemical reactions that turns potential liquid chemical energy into mechanical energy. In most applications, this results in a significant improvement in fuel efficiency and dramatically reduced engine emissions when ECOFUEL SAVER is mixed in with the fuel. Alexander Pope wrote in An Essay On Criticism; "Be not the first by whom the the new are tried, nor yet the last to lay the old aside." Thousands of individuals and companies are currently using ECOFUEL SAVER with fabulous results, so the railroad companies certainly would not be the first to try it. However, the railroad is one of the largest fuel users in the world, and they have very stringent testing and certification guidelines, second only to the aviation industry. After thoroughly testing of ECOFUELSAVER the railroad has determined that ECO-FUEL SAVER is safe to use in locomotive engines and that ECO-FUEL SAVER actually enhances diesel fuel. In August 2011, CAD Railways Industries commissioned a thorough gasoline analysis of regular 87 pump grade gasoline purchased at a local ESSO gas station in Montreal, Quebec, Canada. Fifteen (15) individual certified tests (see OTI CANADA GROUP Gasoline Analysis) were performed to compare thirty-two (32) different chemical properties of the gasoline, both before and after being mixed with Eco-Fuel Saver Fuel Reformulator (EFS). These tests were performed by several independent laboratories under the guidance of the OTI Canada Group. The tests are ASE, ASTM, CARB, EPA, and Canadian EPA certified. The conclusion to these comprehensive tests was that Eco-Fuel Saver did not substantially alter the liquid, chemical properties of gasoline and is safe to run in all gasoline engine applications. In most instances, large commercial fleets are concerned more with the quality of the fuel than even the efficiency of the fuel. Fuel quality directly impacts engine longevity and businesses make their money by keeping their engines and equipment in service, moving up and down the road or doing the work the engine was intended to do. Eco-Fuel Saver does not negatively alter gasoline in its liquid, chemical state. In fact, it slightly improves fuel quality. Eco-Fuel Saver enhanced gasoline offers fuel with a reduction in unwashed gums, benzene, and sulfur, and an increase in available octane. Eco-Fuel Saver also increases the gross heat of combustion of the fuel. Benzene is a natural part of crude oil and gasoline. However, as early as 1948, the American Petroleum Institute stated that it is generally considered that the only safe concentration of benzene is ZERO. The DHAS, OHSA, and the CDC have determined that benzene is a hazardous chemical that causes cancer in humans and should be considered a carcinogenic substance. Benzene exposure can cause bone marrow to not produce enough red blood cells, which can lead to anemia. It can also damage the immune system by changing the levels of antibodies in the blood and can cause the loss of white blood cells. This can lead to leukemia, a cancer of the blood forming organs. Therefore, Eco-Fuel Saver's decrease in benzene levels of one half of one percent is extremely important. Likewise, sulfur is naturally occurring in crude oil and all gasoline and diesel fuel. Elemental sulfur is needed by ALL living things and is an important part of the human body's essential amino acids. However, coal and all oil based fuels release sulfur dioxide (SO2) when the fuel is burned. This sulfur dioxide reacts with the water and oxygen in the atmosphere to produce the extremely caustic compounds of sulfuric acid (H2SO4) and sulfurous acid (H2SO3). Both of these compounds wreak havoc on our environment in what is known as acid rain. Acid rain lowers the pH of soils and water, poisoning and killing plants, aquatic and animal life, and weakens and destroys man-made buildings, bridges, monuments and other structures. 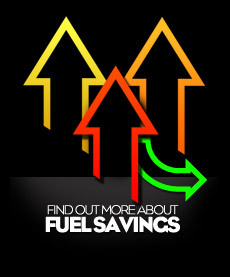 Eco-Fuel Saver's reformulation of the fuel allows for a more complete combustion of the sulfur in the fuel. This reduces the sulfur content escaping into the environment by a whooping eight and one-half (8.5%) percent. It is interesting to note the slight increase in both the research octane number and the motor octane number. Octane is a specific compound that is added to fuel to help control the combustion of the fuel for a more desirable reaction. Eco-Fuel Saver's patent pending process uses its own proprietary catalyst to control the rate of combustion for a more desirable and efficient chemical reaction of the fuel. 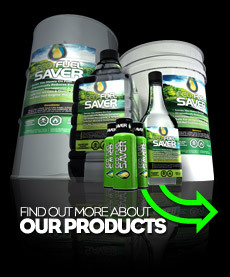 The interesting side effect of using Eco-Fuel Saver in gasoline is that it strengthens the existing octane in the fuel. "Gross heat of combustion" is a measurement of the total amount of potential chemical energy that is available at or during combustion. Eco-Fuel Saver's proprietary catalyst increases the total amount of potential chemical energy (BTU's) that is available for the engine to convert into mechanical energy. 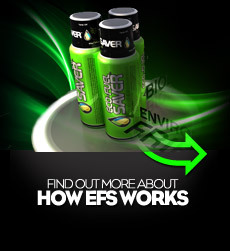 Simply put, EFS helps the fuel, with the aid of the engine, to do what it was designed to do. EFS allows the fuel to combust more completely, through a series of rapid chemical reactions that turn liquid (potential) chemical energy into mechanical energy. All other chemical properties of gasoline remain the same or are improved. Eco-Fuel Saver enhanced fuels meet all local, state, provincial, and federal fuel standards. Therefore, there are no warranty issues. Nor are there issues or worries with fuel tanks, fuel lines, injectors, injector pumps, or engines. Eco-Fuel Saver helps facilitate more complete combustion in the combustion chamber, where many, many chemical reactions are rapidly taking place. Under the increased temperatures and pressures in the combustion chamber, Eco-Fuel Saver's reduced co-efficient of friction allows for better and more complete atomization and combustion of the fuel. In most applications, this results in a significant improvement in fuel efficiency while significantly reducing engine emissions. As required under Canadian & U.S laws, all individual ingredients constituting 10% or greater of the formulation are to be named under Section 3: Composition & Ingredient Information. Eco-Fuel Saver contains two ingredients that meet and/or exceed 10%: Benzyl Alcohol (25%) and Ethanol (65%). Our patent pending combination of proprietary ingredients, known as the "EFS catalytic concentrate", contain eleven individual ingredients and make up the remaining 10% of the composition. The EFS catalytic concentrate, a mere 1/10th of the formulation, is what creates the reaction to restructure hydrocarbon molecular chains. The Ethanol and Benzyl Alcohol act primarily as "carriers" of the EFS Catalytic Concentrate. Eco-Fuel Saver is an environmentally friendly fuel additive that combusts 100% complete when burned. It contains no acetone, carcinogens or heavy metals in its formulation. Also, only synthetic Ethanol is used in Eco-Fuel Saver, we DO NOT USE food based (i.e. Corn) Ethanol. A Catalyst is any substance that works to accelerate a chemical reaction. Catalysts can be organic, synthetic or metal. The process by which the catalyst speeds up or slows down a reaction is called catalysis. For any process to occur, energy known as activation energy is required. Without the help of a catalyst the amount of energy needed to spark a particular reaction is high. When the catalyst is present the activation energy is lowered, thereby making the reaction happen much more efficiently. The catalyst generally works by either changing the structure of a molecule or by bonding to reactant molecules causing them to combine, react and release a product or energy. For example, a catalyst is required for oxygen and hydrogen gases to combine and form water. As part of the extensive testing done by CAD Railway Industries on Eco-Fuel Saver, 20 times the recommended dosage of EFS was added to the fuel and tested in CAD Railways diesel locomotive test engine. This would be equivalent to one and one half 15 ounce (450 ml) bottles being dumped into a 15 gallon fuel tank at once, a total of 22 oz. or 675 mL (this is an extremely excessive rate and would be almost impossible to do by mistake). After several days of testing this extremely high mix ratio of 20 times the recommended dosage (along with other higher than normal ratios of 10 and 5 times the recommended EFS rate), it was conclusively confirmed that EFS DID NOT damage the engine in any way, shape or form. 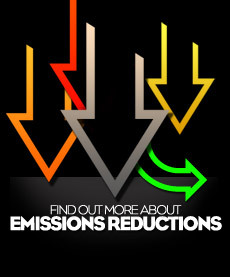 Although emissions rose slightly at super concentration levels, a further small increase in fuel efficiency was still attained. Engine operating and exhaust temperatures were still reduced while combustion firing pressures were further increased. However, the small improvements seen at excessive concentrations of EFS are not enough to offset the additional cost of using more EFS over what is recommended. One the most detrimental contributors to engine fatigue and ultimately, engine failure, is HEAT. Any reduction in engine heat is a positive factor in engine maintenance and longevity. Likewise, any increase in combustion firing pressures is positive, too, as it increases torque/mechanical energy. However, this increase in combustion firing pressures is only good as long as it doesn't lead to heat build up. Increased combustion firing pressures is an indication that either there is more energy (BTU's) in the fuel or that at combustion, more of the energy (BTU's) is available to do work. Either way, an increase in combustion firing pressures while achieving a simultaneous reduction in engine heat, which is what EFS does, is a very good thing. And there is no known fuel additve in the world that can do this other than EFS. The single biggest limiting factor in all internal combustion motors is in controlling detonation. In order to control detonation, however, engine heat must be controlled. EFS reduces the engine operating temperatures by combusting the fuel more efficiently, thereby capturing more of the energy (heat) and turning it into more thrust and torque as evidenced by the increased combustion firing pressures. Due to EFS's unique fuel reformulating characteristics, many engine applications may be able to further advance the timing of the engine. This advancement will lead to even further torque and horsepower increases, as well as greater fuel efficiency increases.